In Christianity, we constantly use familial themes: we call each other “brother” and “sister,” we call upon God as “Father,” we get together and partake from one Cup, after each service we sit down for a meal at the common table, we are taught to care for each other as one would for family… But do we adhere to these teachings? Do we think of our Church as our home, of God as our Father and of each other as a brother or a sister? Quite the opposite often appears to be true. In this age of individualized consumerism, we often treat our Church as a spiritual “supermarket.” We properly recognize that the Church offers us treasures, but instead of communing we consume. If our soul is alive and hungers for God, we come to Church more frequently; if it is on its way to atrophy, we do not feel much of a need and seldom come to Church; and if our soul does not require food any longer because it neither lives nor grows, we may find our way to Church once every few years, if ever. But when we do come, we act like shoppers, rather than children of the kingdom. As in a supermarket, we browse for what we need or like, we “sample,” we may smile at another “shopper” or ask a question at the “customer service desk.” We are untouched by the lives of others and we keep our own life private, hidden from other “shoppers.” We may even like the “store” enough to show up for a “sale” or a “promotion event,” but soon move on with our thoughts, our feelings, our life, with our “loaf of bread” in our shopping bag. Our consumer-like behavior starts with the least noticeable things: we treat the very building of our church and its grounds as if they belonged to someone else. We see trash on the walkway—why pick it up? We see items out of order in the narthex—why bother? It is not ours, we do not know where it belongs. Aren’t there people who work here? Isn’t there staff? “Clean up on isle 2!” This attitude of separation from the Church begins with benign things, but it enters our prayer and our very being. Our Father calls us to attend His Divine Feast. He calls us to the Holy Eucharist—we may come if it is not too inconvenient. Having received an invitation from our relatives to attend a family gathering or a celebration, we make arrangements, travel plans, feel bad if we cannot go due to circumstances beyond our control, call and apologize… But when God, our heavenly Father, calls us to His service, we think nothing of just not showing up. At best, we have reasons: “I have bought a piece of land… I have bought five yoke of oxen… I have a business… Have me excused” (Luke 14:18-19, Matthew 22-5). Even when we are present at the Liturgy, we are absent from it. Liturgia by its very definition is “common work,” but we stand with a wall of our self-importance all around us, alone in a Church full of people, thinking private thought and praying private prayers. We watch the Liturgy, not taking part in it; we are consumers, not participants in a common work. We completely forget that the Church is not a concert or a spectacle, nor a neighborhood supermarket, it is the Body of the Living God, it is our home, the ark of our salvation, the ship which takes us to the calm harbor. As in any living body, a member of the Body of Christ is either fully connected with all Its members and is nourished by the same Blood, or it is cut off and dead. A foot cannot be by itself, choosing when to be in the body and when to leave because it is inconvenient, when to help the body walk, and when to say, "Because I am not a hand, I do not belong to the body" (1 Cor. 12:15). In the same way, a member of Christ’s Body is connected to the Whole by the Blood which runs through all Its members and is either fully living with and in the Body, or is cut off from It and is dead to It. Why is it so important to be in the Body rather than just near It? Because there is no “individual” salvation, alone, by yourself, in your own body. Because only Christ’s Body and no other conquered death, only Christ’s Body and no other ascended into heaven, and if are to have hope of salvation, we must be in that Body and no other. Of course, there is room for solitude in Christianity, for privacy, for lonely silence and for secluded prayer, but not at the core of it, not in the Liturgy and not in the Eucharist. Christ said, “where two or three are gathered together in My name, I am there in the midst of them” (Matthew 18:20). If we do not learn to be in the Body, to live in It in this temporal existence, how can we hope to spend eternity in It after we depart this world? And if we cannot learn to act like God’s children in the physical matters, what hope do we have to suddenly one day transcend into the spiritual realm? 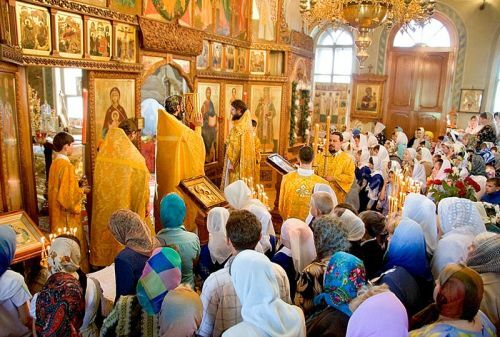 Let us then gather together not in our names, but in God’s, and let us celebrate the Divine Liturgy as our common work, let us be co-laborers with Christ and with one another, let us Commune with His Body and be connected by His Blood, because only in this can we have hope of salvation.